The vaunted Wrestlers Palace in central UB. While in Mongolia, I began to feel unwell, which precipitated several visits to several Doctors both in Ulaanbaatar and back here in Irkutsk. I seem to periodically suffer from excessive fatigue. It comes and goes, and it remains unclear what the culprit is. We continue to investigate. So, a post I began early in April, is now just hitting the presses! I have survived my latest trek into one of Asia’s most beautiful and fascinating countries, Mongolia. It is pleasant indeed to be back in Siberia, with my favorite Native and wife, Yulia the lovely. But before I entirely take my leave, I thought I would share a side of Mongolia which maybe you have not yet seen. The underbelly! 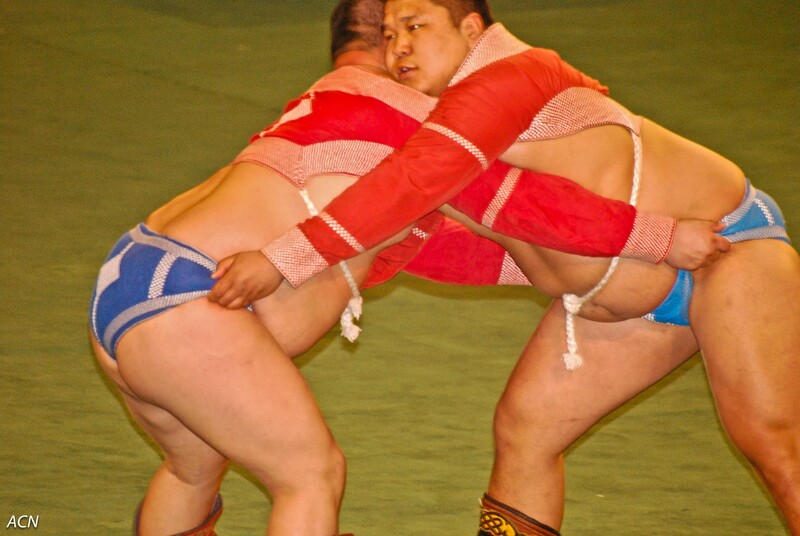 Imagine twenty pairs of rippling/ample bellied Asian strong men in turned up toed boots, and blue or red speedos shoving, grasping, grappling, hoisting-suddenly-heaving their opponent over. Like waves rolling onto a beach, the hubbub of spectating Mongols rises to a roar with each victory. Ya, they wear pink. You got a problem with that? You wrestle them! 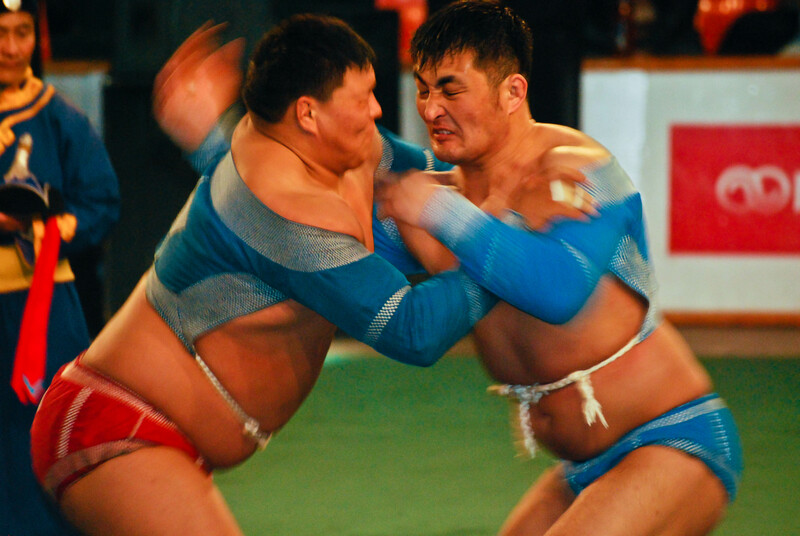 This is called Mongolian Boh, traditional Mongolian wrestling which is practiced in similar forms among all Mongolian peoples. 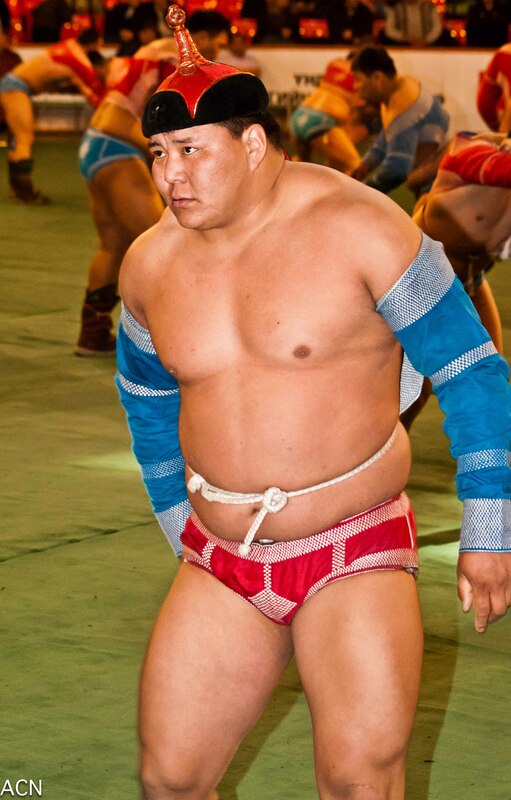 From Inner Mongolia to Siberia, from Mongol ethnic groups in China to Central Asia to Kalmykia in Europe, this style of wrestling has been practiced for centuries. 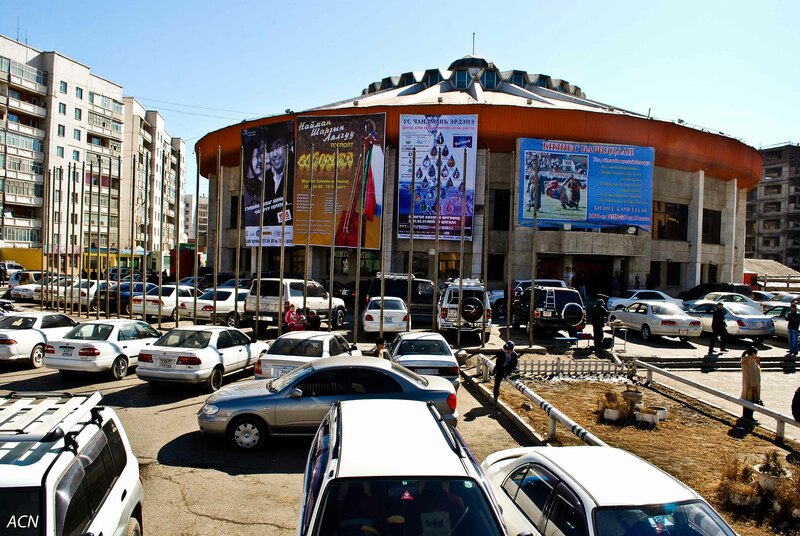 When in Ulaanbaatar, like a dusty moth to a glowing bulb, I am drawn to the Wrestler’s Palace, where most weekends starting in March, you can watch sweating titans go head to head, in two-man scrums, propelling each other to and fro about the ring like fighting buffalo bulls. But don’t be fooled! This is a sport of brains and strategy, not just brawn. Heavy-duty face off. It's about to get rough up in here. This is real wrestling, no hype. There is no jawing, no attacks with folding chairs, no explosions, just two serious athletes going head to head. 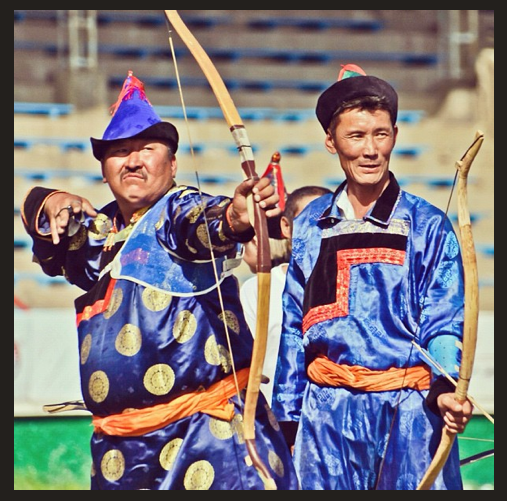 In Mongolia, everyone knows the names of the top wrestlers of their region, and the nation. Champion wrestlers are afforded great respect and are highly honored by the people. What's under that green 1970's turf like carpet? Cement. To win a wrestler must compel his challenger to contact the ground with knee, elbow or upper body. There are no weight categories in Mongol Boh! Unevenly paired wrestlers must use strategy to defeat stronger or swifter wrestlers. The winner will spring up into a traditional victor's dance, gracefully imitating an eagle in flight. When a wrestler brings his adversary down he springs up, runs a few bow-legged steps, stops, and gracefully imitates a flying eagle. Then he returns to his conquered opponent who usually congratulates him, whereupon the referee crowns him with his hat, declaring him winner by calling out his name to the crowd. Our winner then runs to the flagpole in the ring, soars like an eagle around the pole, nodding to the flag before rumbling out of the ring until the next round. It is a thing of wonder. I never heard about Boh while traveling around Mongolia, but I discovered the locals’ infatuation with wrestling when I found myself in the center of Ulaan Baatar when a Mongolian wrestler won at the Olympics: Traffic came to a standstill and people of all ages streamed out of the square onto the main road as the match was broadcast on a gargantuan screen. It was a sight to behold!